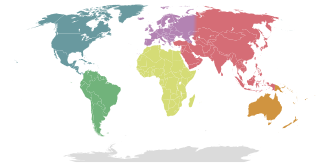 The Netherlands Antilles was a constituent country in the Caribbean Sea. It consisted of two island groups, the ABC islands Curaçao, Bonaire and Aruba just north of Venezuela, and the SSS islands east of the Virgin Islands. Saint Martin is an island in the northeast Caribbean Sea, approximately 300 km (190 mi) east of Puerto Rico. The 87-square-kilometre (34 sq mi) island is divided roughly 60/40 between the French Republic and the Kingdom of the Netherlands, but the two parts are roughly equal in population. The division dates to 1648. 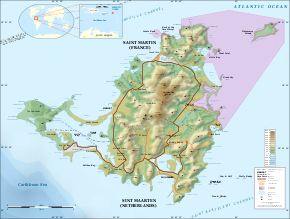 The southern Dutch part comprises Sint Maarten and is one of four constituent countries that form the Kingdom of the Netherlands. The northern French part comprises the Collectivity of Saint Martin and is an overseas collectivity of France. 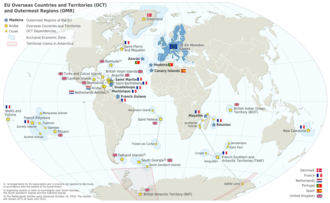 Only the French part of the island is part of the European Union. Princess Juliana International Airport is the main airport on the Caribbean island of Saint Martin/Sint Maarten. The airport is located on the Dutch side of the island, in the country of Sint Maarten. In 2015, the airport handled 1,829,543 passengers and around 60,000 aircraft movements. The airport serves as a hub for Windward Islands Airways and is the major gateway for the smaller Leeward Islands, including Anguilla, Saba, St. Barthélemy and St. Eustatius. 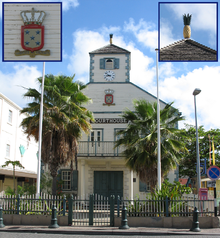 It is named after Queen Juliana, who landed here while still only heir presumptive in 1944, the year after the airport opened. The airport has very low-altitude flyover landing approaches, owing to one end of its runway being extremely close to the shore and Maho Beach. 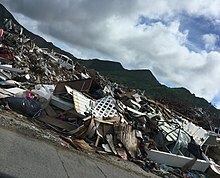 There is also an airport on the French side of the island, in the French Collectivity of Saint Martin, called Aéroport de Grand Case or L'Espérance Airport. 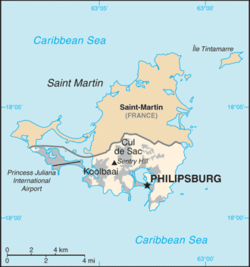 Philipsburg is the main town and capital of the country of Sint Maarten. The town is situated on a narrow stretch of land between Great Bay and the Great Salt Pond. 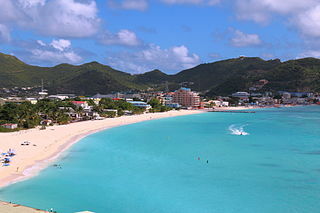 It functions as the commercial center of Saint Martin island, whereof Sint Maarten encompasses the southern half. As of 2011, it has 1,327 inhabitants. Claude Wathey, was a prominent politician of the Democratic Party from the island of Sint Maarten. He was knighted by the Dutch Crown for his political longevity. The following is an alphabetical list of topics related to the former nation of the Netherlands Antilles. Sint Maarten, a country within the Kingdom of the Netherlands, started issuing postal stamps after the dissolution of the Netherlands Antilles on 10 October 2010. The Island thus became one of the five postage regions in the Kingdom of the Netherlands. The first stamp issued showed the map of the island Saint Martin. Marcel Faustiano Augustin Gumbs is a Sint Maarten politician who served as the 2nd Prime Minister of Sint Maarten from 2014 to 2015. He was selected as Prime Minister in the coalition agreement between the United People's Party and the independent Members Parliament Cornelius de Weever and Leona Marlin-Romeo. Prior to becoming Prime Minister he served as a member on the Sint Maarten Council of Advise.